Before I get to far into my review for this book I just want to say, I love this series, and after reading this second installment in his new series of “Camp Half-Blood” books, I must say I am pretty impressed at how Mr. Riordan’s mythological tales still keep my interest, even after 7 books about the same characters (along with a few new additions along the way). Both the original Percy Jackson series and this spin-off series have slight similarities to the Harry Potter world of J.K. Rowling, but if I’m going to compare the two, I think Rick Riordan is definitely the better storyteller. Feel free to shake your head and disagree with me as you will, but when I recall my Harry Potter reading experience, I remember being somewhat bored with the story after the fourth book in that series, which was titled Harry Potter and the Goblet of Fire. I bought The Son of Neptune as soon as it was released. I didn’t receive it until four days later though because I had ordered it online–lately my work schedule is so ridiculously hectic I am either too tired or get home way too late to be able to stop by at my local bookstore to pick up a copy. I could have finished the book in one sitting, but I ended up spending three days on it. This was partially because I had so much work to get done that took priority over a leisure read, and partially because I know Mr. Riordan isn’t planning on releasing the next book until Fall 2012, so I was trying to hold off until then. However, this book was very entertaining and I could not put it down. I wouldn’t necessarily call it a traditional classic by any means. I can’t even say it’s a timeless or universal book, because I can see some people thinking the story is too childish or it not fitting someone’s tastes–but I definitely think it is a well-written children’s series. I’m not shy to admit that occasionally I find myself browsing through the children’s section to see if there’s anything good there to read. Sometimes I find that children’s books are the best. While I don’t think I could enjoy it nearly as much now as I would have when I was younger, books like this one definitely tap into my inner child. If I’m going to be honest, I was a little let down by the first installment of this second spin-offish series. (While I’ve seen in store descriptions that this series is a spin-off of the original, I personally find this to be only partially true, but I’ll explain that in a minute.) The first book in this new series, The Heroes of Olympus series, called The Lost Hero was not entirely what I expected. The five books of the first series were all written in first person (which I thought was incredibly impressive, by the way, I don’t think I could write five whole books all in first person), but in this second series, it’s written in third person. The chapter titles are also not as creative as they were in the first series; now the chapters are titled by the name of the character whose lens were are looking through as we read more of the story. It’s slightly less engaging, but it works for this series. That and the fact that we were being introduced to a whole new set of characters and a different side of the gods (if you’re confused as to what I mean, go and get a copy of the book and read it! ), made the transition a little difficult for me. However, unlike the world of vampires, witches, werewolves, and ghouls, I find that I’m a complete sucker for books written about ancient mythology; which is exactly what Mr. Riordan writes about in his children’s books. Needless to say, I couldn’t give up on this series just yet. Unsurprisingly, it turns out I made the right decision. 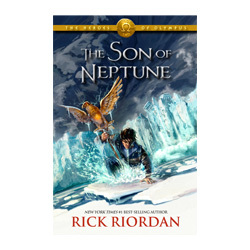 The Son of Neptune definitely packs a punch that I didn’t feel from The Lost Hero. While it’s still written in shifting third-person perspectives, Mr. Riordan did something with this book that I absolutely love–creating feelings of nostalgia. It’s an attribute that I think is a great strength, particularly to comedians. What I mean is basically in this book, he makes many connections with his first series; and he does it so seamlessly that I feel like this second series is more of a continuation than a spin-off. As a public relations major, I couldn’t help but mentally applaud him for sort of doing his own PR for his first series–while you can totally read The Lost Hero and The Son of Neptune without having read any of the earlier Percy Jackson books, a lot of the plot makes ten times more sense if you have read them. Even better, I was also pleasantly surprised that I had to go back and “consult” previous books in order to refresh myself and make connections between parallels in the two different stories. I suppose this makes me an incredible book nerd, but I loved that about this book. I read his first series very carefully, so I thought I had retained all of the information, but it turns out I had forgotten a lot of the story overtime. As an avid book reader, nothing pleases me more than when an author makes me feel I have to go back and read earlier installments or parts of the story again, just to keep everything straight in my head. Overall, I love Rick Riordan’s fiction–anything related to Greek, Roman, Norse, and Egyptian mythology is a huge win for me, and his books definitely cater to those subjects; not to mention, he’s got a bit of background in them as well. Anyway, if you’re open to reading children’s books, or if you’d like to introduce your child to one, this is definitely one I would recommend. I think this installment was a solid B. It wasn’t perfect, but it definitely made for an entertaining read. Needless to say, I can’t wait for next fall! I wish it would come around faster! Haha.